Jana Petken, a Denia resident and writer, has published a book that just might put Denia on the world literary map. Her book promises to pique the attention of Spanish history aficionados and lovers of dramatic family stories. She has written about a family saga that looks at the ever changing psychological effects war brings to each family member. In this respect, it is the Spanish Civil War that is driving her characters. We met for a photography session and talked about writing and publishing. 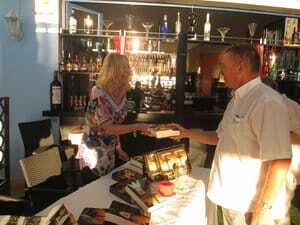 Jana showed me her book and announced that her book signing was the following week. Sadly, I could not attend, but I felt proud of her all the same. In this interview, Jana shares her journey towards writing the book from developing the characters to the plots and back! • Location Living: Denia, Alicante. • Married: Divorced, these last ten years. • Children: No children but a beautiful dog, Reina, my best friend. Q. What was the motivation behind the scripting of your book? A. I have always had the urge and passion for writing since early childhood, but the motivation to write, “The Guardian of Secrets and Her Deathly Pact,” came by accident, literally. I found myself very ill after hitting my head on an aircraft during turbulence. This resulted in a major operation on my spinal cord at the neck. After the operation I lost the use of my hands and was cocooned at home with nothing but the television for company. Physiotherapy was suggested and I was told to move my fingers and hands, to massage them, and to slide two small silver balls around my palms day and night, in an attempt to regain feeling. Instead, I bought myself a computer and began tapping away, not really knowing what I was going to write about but thinking that the exercise might help to help regain mobility in my extremities. I grew up in Spain and lived under the dictatorship of General Franco. I remember, very clearly, my childhood living at the beach and in particular the patrolling Guardia Civil with guns, looking very austere and scaring me just a little. They trudged up and down the sandy shoreline every day and eventually awakened my curiosity. In later years, I learned about the Spanish Civil War and about the legacy it had left on the Spanish people. I researched, read books, and spoke to war survivors. When I decided to write my first novel, I just knew that the Spanish Civil War would be the perfect subject. When the prologue was written, I also realised that I wanted it to be more than just a war story. People have always fascinated me. I am a “people watcher,” so I decided to incorporate a family saga into the novel, one, which would begin long before the war began. I had my ideas, which grew with each page. I had the goal to write about a subject very close to my heart. My motivation was therefore twofold; Therapeutic healing both mentally and physically, and my interest in war, a family’s journey, and man’s behaviour and character under extreme circumstances. Q. How long did it take from start to finish? A. The book took six years to complete. The first draft was on paper, but I decided that it was only a first attempt and that it still needed a great deal of work. I drafted several more times in the following years and the book doubled in size. One day in March 2013, I believed it had come to the end of its long journey, and it was then I found the courage to send it out to be proof read and edited. When the final manuscript came back I, for reasons unknown to this day, added another couple of chapters. In answer to your question, the book took approximately 10 years to complete from start to finish. Q. You say that the characters in your book are fiction – but are the stories as well? Is there not a wee bit of truth in the plots? A. The characters are all fictional. There is a broad array of colourful personalities, which the reader will either, love or hate, laugh at or cry with. The character building process was, for me, the most enjoyable part of the writing process and allowed me to use my over imagination; a character trait of my own. I also have to be honest and say that my extensive travelling and the people I met along the way did influence me slightly when it came to a couple of the most major characters in the book. The first part of the book is total fiction but part two deals with The Spanish Civil War, which I used as a factual backdrop for the family. However their lives and adventures during this period continued to be completely fictional. Q. What are you hopes for this book?